1. Locate your Karcher Product ID from the list below to view a printable parts diagram. The Product ID is located on a sticker or tag, often near the serial number. The Product ID is the only accurate way to find the proper diagram since some models are produced with several different Product IDs. The diagram will open as a pdf file in a new window. 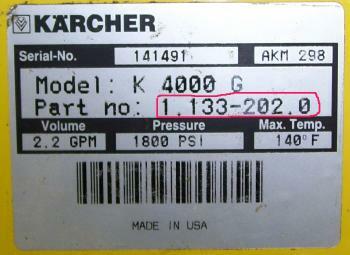 Use that diagram to determine the Karcher part numbers of the items you need. Matches 1-50 of 4476 shown.